Galion resident Samantha Bell is a member of the Ohio Stingrays 10U softball team that will be competing at the 2015 ASA/USA Nationals July 26-Aug. 3 in Normal, Ill. Front row, from left, Sidney Payton, Kirnan Bailey, Kaylyn Hopf, Jordan George and Stevie Asher; back row, from left, Madison Jellison, Dakota Staffin, Emma Calkins, Hannah Hunt and Samantha Bell. 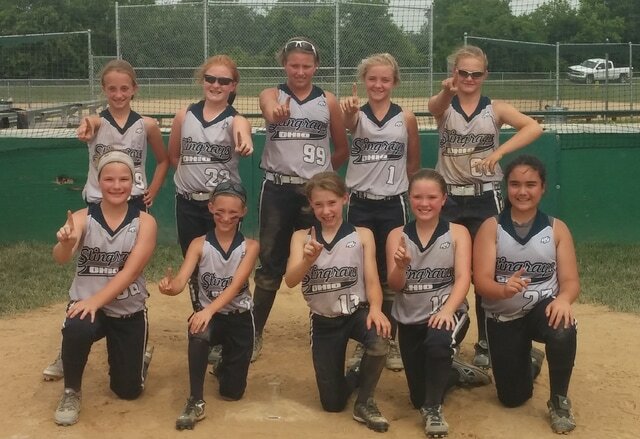 The Ohio Stingrays 10U softball team won the Dayton Metro Tournament held June 5-7. With the win, the Stingrays earned a berth in the ASA/USA 10U Nationals scheduled for July 26-Aug. 3 in Normal, Ill.
Galion resident Samantha Bell is one of the team members. She is the daughter of Tim and Julie Bell and will be a sixth-grader at William Crawford Intermediate School this fall. The team is based in Pataskala in Licking County and is coached by Marc George, Mike Jellison and Matt Bailey. According to the team website, the Stingrays record this season is 71-7-1. Bell’s Stingray teammates are Sidney Payton (Greenfield), Kirnan Bailey (Blacklick), Kaylyn Hopf (Pataskala), Jordan George (New Albany), Stevie Asher (Mount Vernon), Madison Jellison (Pataskala), Dakota Staffin (Utica), Emma Calkins (Mount Vernon) and Hannah Hunt (Pataskala).